Today, I did some simple character development. This came from the thought, perish it possibly, that I might change the name of Romeo Jones, my signature crime fiction character. 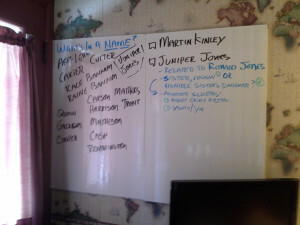 I took names scrawled in my small Moleskin notebook and applied them to my idea boards. I’m looking to what comes to mind, but also what “sounds” good. Does the name roll of the tongue with grace and rhythm? I’m definitely liking the name Juniper Jones. She could possibly be a character in the Romeo Jones universe. Possibly an amateur sleuth. Maybe his sister or cousin. In this case, I could venture into adult crime fiction with her, or merely add her to the cast of a Rome novel. Or maybe she’s Rome’s niece, his only sister’s daughter, perhaps with special needs or a similar sarcastic side she got from her Uncle Rome. Then I could drop her into some Youth or Young Adult fiction, mystery and so. The imagination can run wild.